Key to winning the nations back is winning the hearts of those who disagree with you most. December 21, 2013 (Tony Cartalucci) - The regime of Thaksin Shinawatra built itself upon a foundation of corruption, deceit, fear, intimidation, bigotry, violence, and mass murder. Its followers, the "red shirts," are notorious thugs, having barricaded schools threatening teachers and parents, slapping university lecturers, and even going as far as hacking their opponents to pieces, committing massive city-wide arson, and armed insurrection. Though they only represent at most 7% of the population, with a mere 35% of all eligible voters having cast their ballots for the current regime, the silent majority fears them. It wasn't until people began organizing against the ill-conceived, criminal "amnesty bill" that the silent majority realized their own true strength and the crumbling rot that hid just under the surface of the regime's "majority" rhetoric. But with this incredible strength comes incredible responsibility, and how we manage that responsibility will determine the longevity and effectiveness of this movement and its many aims in both the short and long-term. Veteran journalist Michael Yon has now on multiple occasions pointed out the crass vitriol emanating from pro-regime propagandists who spend literally all day and all night engaged in name-calling, smearing, and other detestable, anti-social behavior. However, Yon refuses to wade into the gutter with his opponents and not only intelligently identifies and condemns their behavior, but does so with civility and class. 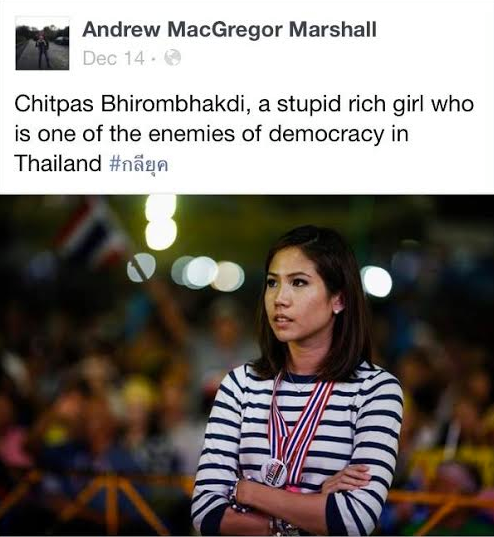 The person who writes these things, Andrew MacGregor Marshall, previously worked for Reuters in Thailand. After a tantrum, he quit Reuters. Many people ask why it is so difficult to get honest, thoughtful reporting. That outlets continue to hire the wrong folks is killing the media industry. Here the journalist insults a woman for no cause -- her English is perfect. She obviously is well educated, and smart. So sad to see journalism dying. Her car got firebombed the other day and she responded by going to work. That is a vote of confidence. Indeed, this "stupid rich girl," in the face of violent intimidation, pressed on with her cause, proving with actions that the baseless, mere words of Marshall were just that - baseless. Both Yon and Chitpas leave Marshall looking silly, childish, sorely lacking the legitimacy his former position at Reuters had granted him, and most importantly - alone in the gutter. Not only does Yon respond with facts to counter the crass, baseless insults leveled by Marshall, he demonstrates to his audience both his respect toward their intelligence and maturity, as well as a dedication to civilized discourse. This doubly validates his position and serves as an example for all in the anti-regime movement to follow. Place your army in deadly peril, and it will survive; plunge it into desperate straits, and it will come off in safety. For it is precisely when a force has fallen into harm's way that is capable of striking a blow for victory. By pressuring the rank and file of your opponents, you are giving the leaders of your opposition a golden opportunity to galvanize a movement that might otherwise unravel. Instead, build bridges designed specifically for different segments of the opposition's rank and file (police, farmers, politicians, laborers) to cross over, safely and without fear. As the regime continues to crumble, those who had supported it will see a clear and tempting avenue of escape. When they see others crossing over and being welcomed and treated well, the barriers of fear keeping them under the noxious clouds of the regime will lower and they will follow. One example of this could be for the thousands of rice farmers that have been cheated by the regime's vote-buying rice scheme. In addition to pointing out the flaws of policy, a new policy and a place among the protest should be created for the forsaken farmers. As the regime continues to crumble, rice farmers will increasingly see that spot prepared for them as a tempting refuge from the regime's incompetence and corruption. One of the strongest selling points of the current anti-regime protests has been the peaceful nature of 2, soon to be 3 mass mobilizations. People see the thuggery of the regime's "red shirts" evaporating before this organized force and feel safer. It is important for them to continue feeling safe. Ways to reassure them is to examine the crass demagoguery, vitriol, insults, intimidation, violence, and other ugly behavior that have become the hallmarks of the "red shirt" movement, and ensure that the anti-regime protests adopt the very opposite of postures - decisively condemning and disowning those who fail to do so. Michael Yon, Chitpas Bhirombhakdi, and many others, prove that intelligent civility and courage is all one needs to make a difference and move the hearts of the people. Even those that do not agree with the ends of the protests, will at least agree with the means. There is no point of entering the gutter and rolling around with the regime. The regime's place in the gutter is precisely what has made it so repulsive to begin with - by entering the gutter with it, we've simply become just as tarnished. Keep it clean, stay above the gutter, and don't just say your movement is better, prove it daily, hourly, and in every minute through actions that it is better.